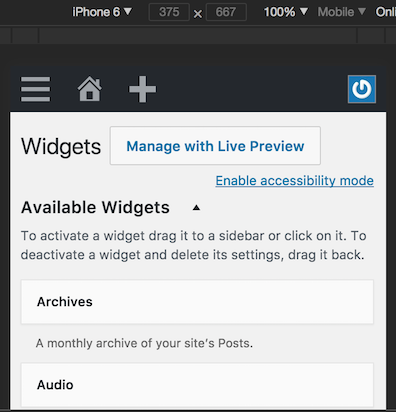 During WCUS contributor day we've tested the Widget page with Alex Stine and found that the placement of the Enable accessibility mode link could be improved a lot. Alex uses Firefox and NVDA and he's an experienced WordPress uses but he just didn't know about the Enable accessibility mode link. The point is this link is hard to find (hidden by default in the screen options tab) and could be placed in a more discoverable place. Right after the main heading would be a good option because screen reader uses often use headings for navigation. 42778.diff​ (970 bytes) - added by chetan200891 17 months ago. 42778.2.patch​ (2.4 KB) - added by antonioeatgoat 17 months ago. 42778.2.diff​ (3.3 KB) - added by chetan200891 15 months ago. Created patch for solution agreed by design team. 42778.3.diff​ (3.7 KB) - added by afercia 14 months ago. 42778.4.diff​ (3.2 KB) - added by afercia 14 months ago. @afercia I have created patch 42778.diff to make the Enable accessibility mode link more discoverable. So it will look like this. What about handle it as the "Manage with Live Preview" button? Working like that in the second patch. What about handle it as the "Manage with Live Preview" button? this link should always be visible: many users don't even know there's an "accessibility mode"
The design team discussed the solution given in @chetan200891 's video and we all agreed to this being a really good solution. Looking forward to seeing the patch implemented! 42778.3.diff​ refreshes the patch and removes a switch statement in class-wp-screen.php, as using a switch for only 1 case (plus the default) seems a bit excessive. Not sure if it will need a dev notes post for the removal of the screen_settings filter, as it seems it was only used in this page for internal purposes. Going to add the needs-dev-note keyword to be sure it gets considered. This ticket was mentioned in ​Slack in #core-committers by afercia. ​View the logs. Looking at 42778.3.diff I don't see why we need to remove the screen_settings filter. Thinking we should keep it. A plugin can use it to add any screen settings to any screen. @azaozz thanks. Will restore the filter. It was removed based on the comment This filter is currently only used on the Widgets screen to enable accessibility mode. :) I guess it's safer to keep it. 42778.4.diff​ restores the screen_settings filter. Accessibility: Make the Widgets screen "Enable accessibility mode" link more discoverable. "Accessibility mode" easily discoverable for everyone. This ticket was mentioned in ​Slack in #accessibility by chetan200891. ​View the logs.